Yesterday, I was happy to find an e-mail from Maximilian Büsser in my inbox. He is pre-releasing some ‘SIHH’ news on the internet already. Just recently, I posted news on his Horological Machine No.3. However, he now introduces the Ceramic model of the HM2. There are two versions of the new HM2: a ceramic with red gold (HM2-CR) and ceramic with titanium (HM2-CTi). The HM2-CR is a limited edition of 33 pieces (and only 11 produced in 2009) and the HM2-CTi is a limited edition of 66 pieces (and only 22 produced this year). 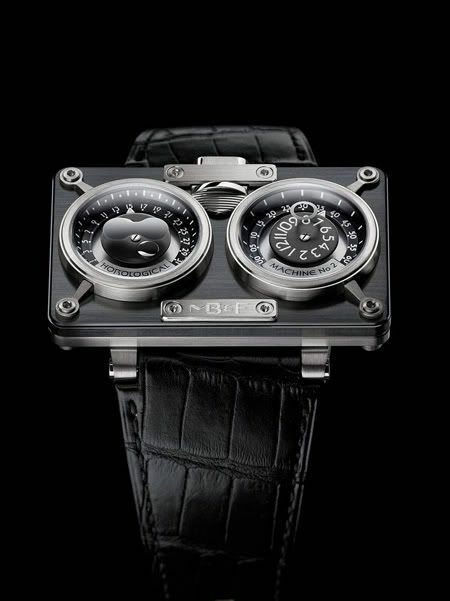 To be able to create the Ceramic parts of this watch, diamond cutting tools are nescessary equipment for MB&F. Although I am way too young to wear gold :-), I do love the HM2-CR – that’s the ceramic with red gold – with its nice color contrast. The retrograde date and bi-hemisphere moon phase is on the left dial and the (jump) hour and minutes (also retrograde) are on the right dial. No wonder the case is almost 6 centimeters in width! The jump hour/retrograde mechanism developed by Jean-Marc Wiederrecht. The SIHH is worth visiting for this Horological Machine only! I am eagerly waiting for the first pictures of this watch in the flesh. 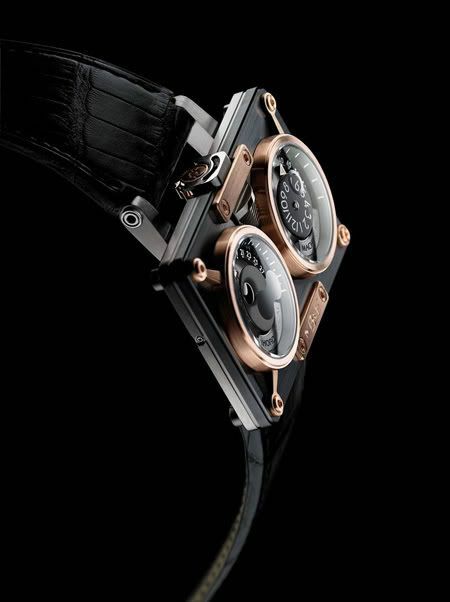 What do you think of these haute horlogerie timepieces? Exceptional watchmaking or too haut for you? Please leave a comment!